Stretching to 6 metres high, twisting and curling, Bedlam Oz’s slinkies thrill audiences with playful and mesmerising performances. Join in with the ‘oohs’ and ‘ahhhs’ as you witness this charming story of two huge slinkies falling in love. 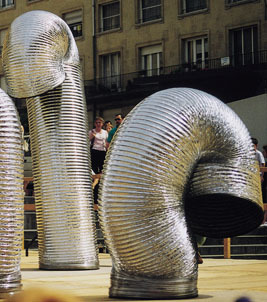 Performed across the globe since 1996, Slinkie Love is an international street theatre classic! Devised by: David Mills and Danielle Boucher; musical score: David Turley; performed by: Raewyn Thomas and John Clay.